I just had an idea – anyone know where you can buy hoses that clip of screw onto scrader valves? Car tyre + 1/4 turn valve + 2 female scraders (or 1 scrader plus one presta) and voila -instant 30-40psi reservoir and fast siphon. Anyone killed themselves/blown their face off/destroyed part of their house using this thing yet? Built one of these yesterday, great invention! Cost me about a fiver, aquarium tubing, plus bottle of Diet Coke. Awesome! Very nerve wracking pumping it up to 80psi, but all good so far. Another satisfied customer of this thread here. Followed the OP’s instructions more or less exactly, used 4.7mm ID windscreen washer tubing (which I already had for bleeding brakes) which was a very tight fit but just about ok. Mole grips to hold the tube worked well. Needed 60psi in the bottle to get a slack old High Roller to inflate on a Flow, with rimstrip. Didn’t blow my face off or destroy the house, which was a bonus. Cheers! Its amazing how quickly it’ll blow up a tyre though! From soggy bottle rocket experience a 2 ltr Coke bottle goes at any where between 150 and 180 psi. That’s when 30% full of water. Never had one fail at less than 140 psi. Thanks to all who posted on this thread – managed to inflate an extremely stubborn Swampthing tonight using a 2 litre lemonade bottle! It had resisted all other efforts, almost used up a whole bottle of washing-up liquid the other night with no success. Bit of a let-down though, the tubing cost me £2.49 from Halfords! prouster – how comes I never get anything useful from Halfrauds? Diving bottle works well. I’ve got a 209 bar 3ltr bottle off a mate who bought about 4000 at auction (ex-Falklands escape breathing apparatus for the troops who were transported by ship). 209 bar is about 3030 psi, so it will inflate anything from bike tyres to a paddling pool in about 3 seconds. How many psi in the bottle did it take? Same as you – 80ish psi. Also only worked when I took the valve core out – but then it popped straight up. How comes I never get anything useful from Halfrauds? if anyone wants a cheap steel tank, try a commercial vehicle breakers. They have an endless supply of air brake tanks which can be had for a few quid. 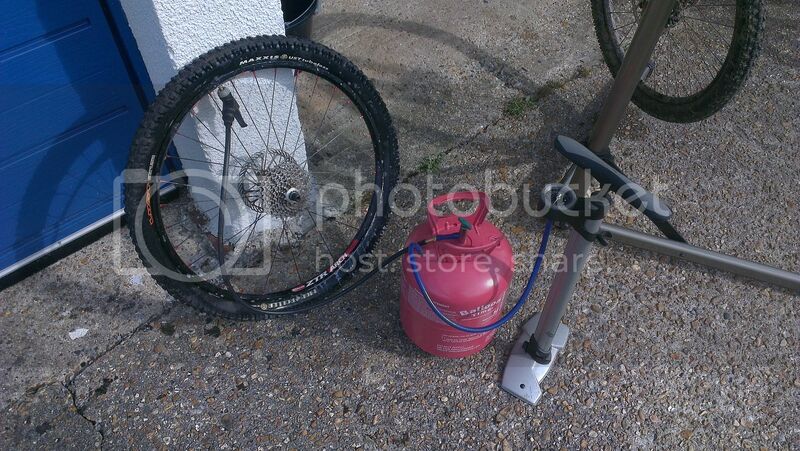 Just inflated two 2.35 super tacky high rollers onto Mavic CrossRide wheels using a 3ltr cider bottle at 110PSI. Worked beautifully. Note to self, don’t use that 2l tesco plastic milk carton again. 40 psi and BANG! Having built and successfully used one last night, am now going to enter Scrapheap Challenge! Classic Bodge. Stan’s should post a link to this thread on their website..
Well done whoever invented this contraption. Another happy customer. After having a nightmare trying to seat a non-UST Baron on Mavic 819s thought I’d give it a go. That looks ace but using an appropriately sturdy container takes the fun and danger out of it! Someone on another forum told me of this method and I put a thread on here about it …. Final gave this a go. 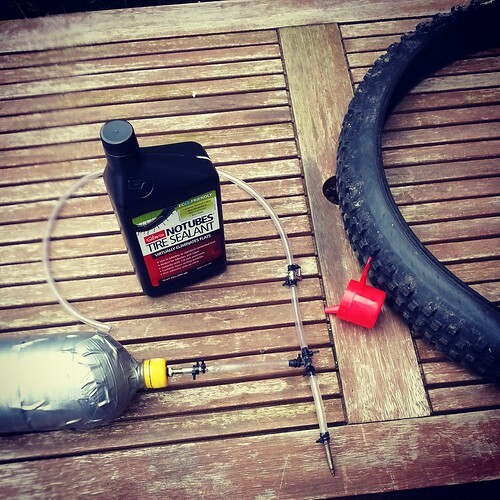 My first attempt at tubeless. Worked first time, I think it was beginners luck. Going to have a bash at this as I’ve got two dud inner tubes and a pop bottle to hand. Is it easier to drill one hole in the cap and one in the base (in which case are there any tricks for getting the valve through the bottom hole) or two holes in the cap? I drilled two holes in the top cap. I wouldn’t drill a hole in the base as I reckon it would compromise the bottle. connected to the tyre: a core-less schraeder valve in the shoulder of the bottle – it’s one of those schraeder’s that has an external thread+locknut – so i can use the locknut to secure/seal the valve. I wouldn’t drill a hole in the base as I reckon it would compromise the bottle. i only need to pump mine to 40psi, experiments with pop-bottles in my youth revealed that they can handle at least 150psi.. Wrapped mine in duck tape! Ask and ye shall receive. Note valve at the bottom.